I’m very sorry to report the passing of a real cartooning icon, Mr. Carson Van Osten. The L.A. Times Obituary writer can’t seem to decide whether Carson left us on November or December 22nd, 2015, but this Obit. didn’t get published until January 10th, 2016. Carson started out animating or assisting, maybe both. I can’t remember if he always worked at Disney’s or not. Perhaps I met him during my freelancing years in the 1970s and 1980s. He got kicked upstairs at Disney’s, becoming a model trouble-shooter on all the classic characters, especially Mickey Mouse. In 1988, I was doing some animation on the “Mickey’s 60th” TV special. One of the segments of that special featured Mickey’s visit to the “Cheers” bar. 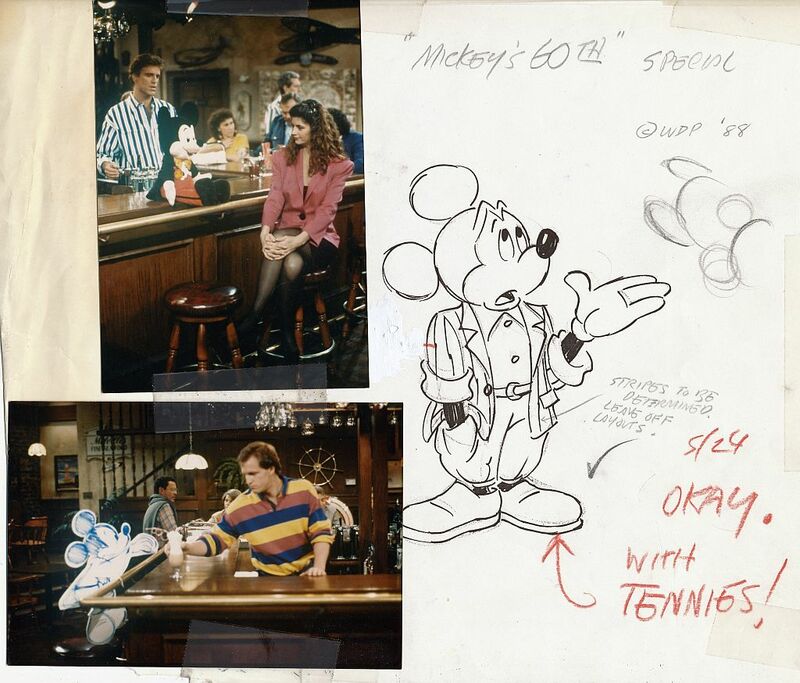 If you look at the snapshots above, you’ll see Kirstie Alley and Ted Danson with Mouse stand-ins, arranged so we animators could gauge the relative sizes of Mickey and the “Cheers” cast. I remember it was kind of risque to have Mickey in a bar setting, I hadn’t seen “Plight of the Bumble Bee” at that point, or the idea of the mix of alcohol and Mouse wouldn’t have seemed so radical. To the right of the Cheers snapshots, you’ll see a rough sketch that Carson drew of Mickey in a casual outfit, complete with tennis shoes. The notes in red, are in my friend Sam Cornell’s printed script. Sam directed the “Cheers” sequence, and I seem to recall he was quite taken with Ms. Alley. Carson worked on many Disney television projects, merchandise designs and notably, the comic strip department. If you look around the Internet, you’ll probably find some of Carson’s wonderful “style guides”, which not only featured Disney character drawing hints, but advice on how to make an effective panel layout, the “silhouette” rule, and other theories. I didn’t realize that Carson had gone to Disney Paris, in 1994, or was voted a Disney Legend this past August. Carson was a very talented cartoonist, and evidently a painter of miniatures as well. (Read the Obit.) In addition, Carson was a heckova nice guy, a very patient teacher and very fast on the comeback, especially when defending his drawing expertise. I haven’t seen him since 1988, but I’ll always remember. This little post is designed as a memorial to Carson; who should be remembered by anyone who admires good Disney-style drawing in the classic manner. Adios, good friend. Felix, from 12-10 to 12-16-1934 has Felix emerging from his hollow tree hiding place and attempting to return the stolen jewelry that the robber put into the tree. It turns out that the jewels belong to the Danny Dingle family! Felix is reunited with his favorite family at last. In the Sunday, Elmer the millionaire kicks Felix out of his house, and back IN to win a bet with his wife. Felix now has TWO families, Daily and Sunday. Myrtle’s from 9-13 to 9-19-1948 this post, a bunch of non-continuity gags this time in the dailies. The Sunday features Hyacinth the Cat in a non-speaking role as the neighborhood meets the local Weatherman. I admire the way Fisher designs the Sunday pages so that the reader can start anywhere on the page, with any balloon, and understand the story. Krazy, from 12-21 to 12-26-1942, the characters keep busy for “Our Duration”. Mrs. Kwakk-Wakk in the 12-21 is thought by Krazy to be a “Snoopa”. The brick is delivered by air on the 22nd and 23rd, and Offissa Pupp’s Jail goes plastic, followed by Ignatz’s Brick on the 24th and 25th. Durable goods made out of plastic were considered very newfangled in the 1940s, reference the Donald Duck cartoon, “The Plastics Inventor” (1944) with the Duck’s all-plastic airplane that melts in water. 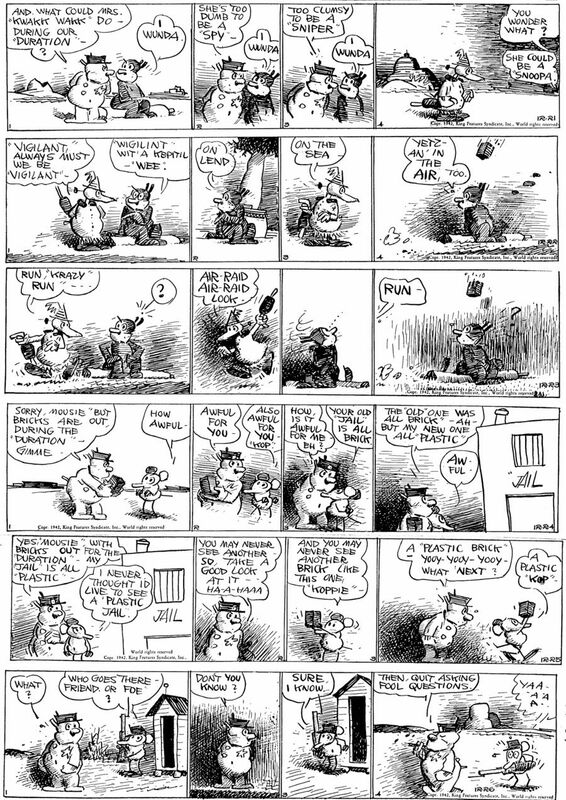 Ignatz actually pulls a rifle on Offissa Pupp in the Dec. 26th strip, but the Pupp ignores him. I hope that Carson read my blog from time to time, he was a great fan of Gottfredson and Barks. This entry was posted on Thursday, January 14th, 2016 at 3:23 am and is filed under Uncategorized. You can follow any responses to this entry through the RSS 2.0 feed. You can skip to the end and leave a response. Pinging is currently not allowed. Touching tribute to Carson. Thanks for sharing! Hey Mark,I first meet Carson. At John Wilson’s Fine Arts Films on Shinbone Alley.You must of meet him there too.He was a super talented nice guy.I never saw him avajn but always heard good things about him thrust the years.My condolences to the family. By the way did you vet the 2 watercolors I sent you and Cathy? Hey, Mark. I was interested in buying any drawings from Heavy Traffic. Please let me know if you are willing to part with anything you still have. I am a big fan of your style and I can not get enough of it. I fall in love with it over and over again. I will look to see if I have any more from HT that I want to sell. Thanks for your nice words about my drawing style. I don’t draw as much as I used to, but I really enjoy it when I get the chance.